Capacity: 18,000 (1895); 20,000 (1929); 18,800 (1930). Viewpoint Tickets - Best prices on Phillies tickets, Baseball tickets and MLB All Star tickets. 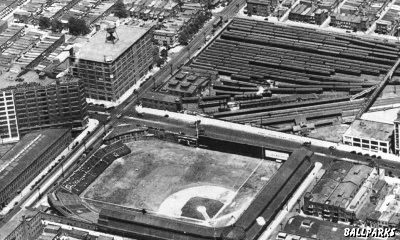 Location: Left field (N), West Lehigh Avenue; third base (W), North 15th Street; first base (S), West Huntingdon Street; right field (E), North Broad Street; Philadelphia and Reading Railroad tunnel beneath outfield. Dimensions: Left field: 335 ft. (1921), 341.5 ft. (1926), 341 ft. (1930), 341.5 ft. (1931); center field: 408 ft.; right-center: 300 ft.; right field: 272 ft. (1921), 279.5 ft. (1924), 280.5 ft. (1925); backstop: 60 ft. Fences: Left field: 4 ft. (1895), 12 ft. (1929); center-field clubhouse: 35 ft. (with 12 ft. screen on top, 1915); right field: 40 ft. (tin over brick, 1895), 60 ft. (40 ft. tin over brick, topped by 20 ft. screen, 1915). A.K.A. : Huntingdon Street Baseball Grounds (1895 to July 1913), National League Park (III) (1895 to 1938), Hump, Cigar Box, Band Box and Philadelphia Park. Named after Phillies owner William F. Baker. 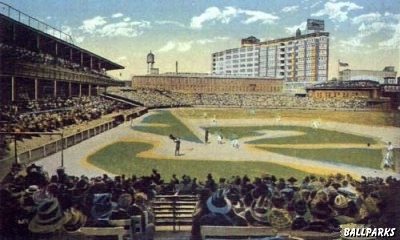 Nicknamed "the Hump" because it was on an elevated piece of ground that had a railroad tunnel underneath the outfield. Swimming pool in the basement of the center-field clubhouse prior to World War I. "Health Soap Stops B.O." Lifebuoy sign on the high right-field wall. Extra seats added in front of the fence in center for the 1915 World Series led directly to the Phillies losing the Series� last game. During Prohibition the outfield wall liquor ads were boarded over with grimy blank boards. Home plate moved back a foot in 1925, making the right field foul pole 280.5 feet rather than 279.5 feet from the plate. Philadelphia's Old Ballparks by Rich Westcott. View inside the Baker Bowl courtesy of the Franklin Digital Collection. Aerial view of the Baker Bowl courtesy of the Temple University Urban Archives Center. 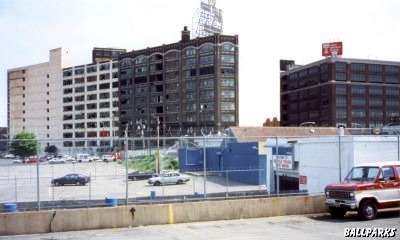 View of the Baker Bowl site today © 1999 by Paul Munsey. Special thanks to Leo Panetta. Tickets to NCAA Basketball Tournament, College Football Bowl, NCAA Football, Paul McCartney and Philadelphia Phillies provided by Ticket Triangle.